Download My Talking Tom APK latest version for Android devices from APKWing. It is a free casual game for Android developed and offered by Outfit7. My Talking Tom is one of the top Android game downloaded more than 500 million times just from the Google play store itself. In this game, you'll adopt a baby kitten named Tom and feed him and help him grow as your virtual pet. You can also get APK of My Talking Angela from our website which is also similar to this game but with the female version. In My Talking Tom Android game, you'll help Tom grow into a super cool completely grown virtual cat. 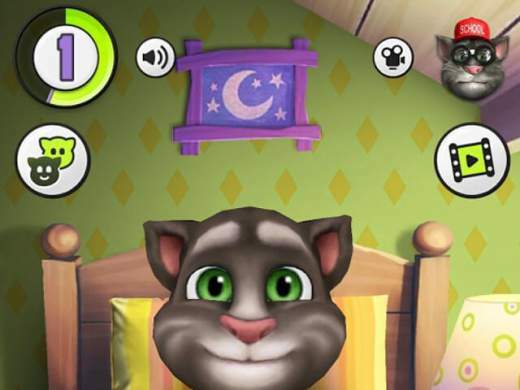 There are many things you can do in this game after downloading the APK of My Talking Tom from our website. You can dress the cat in different colorful outfits and put some cool accessories to make him look really smart. You can have great fun with Tom as your virtual pet. With the latest version of My Talking Tom, you'll be able to dress him in a fireman's uniform so that he'll look cooler than ever before. He has a fire-breathing dragon helmet that breathes fire from the mouth. In this game, Tom will repeat whatever you want him to say. If you want to raise a puppy instead of a cat then play My Talking Hank game on your mobile. There are some mini-games you can take part in like puzzle, action, rocket fun, bubble shooter, Happy Connect, Flappy tom, Rainbows etc. Name your pet whatever you want, feed him his favorite food, play with him, take him to sleep, and watch him grow from a cute kitten to well-grown virtual cat. You can choose from the thousands of unique furs, outfits, accessories and customize him accordingly. Decorate Tom's home with the best furniture. You'll see tom happy, sad, sleepy, hungry, and bored as emotions change based on how to treat him. There are as many as 999 levels with 9 different stages, unlimited rewards, new items, and icons. Adopt a baby kitten and help him grow into a super cool virtual cat. Feed him, play with him, dress him in different outfits, take him to sleep, etc. Interact with TOM as he will repeat whatever you say. Get him his dream outfit - fireman uniform. Take part in some popular mini-games and earn gold coins. Travel with him to meet other Toms all around the world. Decorate his house by selecting the best furniture for his home. Choose from thousands of combinations of clothes, outfits, accessories, etc. My Talking Tom has been the #1 game in 135 countries. Grow him like your own pet in this fun, addictive game. Click on the below button to start downloading the APK of My Talking Tom 4.6.4.55 latest version for Android device.